Hamlet really knows how to make a presentation. 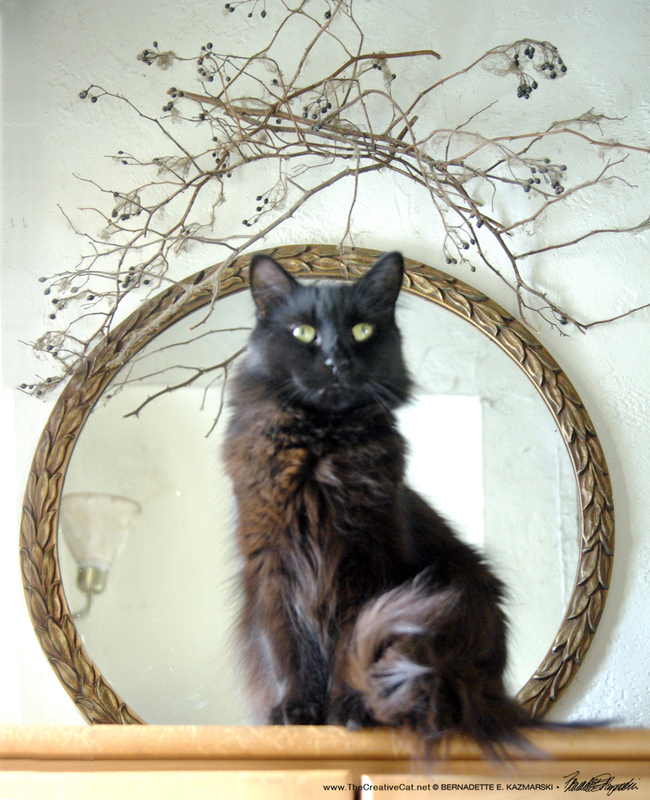 I walked up the stairs to see him sitting regally on the wardrobe and actually turned around and sneaked back down to get my camera because I really wanted to capture the turned three-quarter posture, the distant eyes, the fluffy tail curled against his hip, its long hair splayed along the curve, all purrfectly centered in the round antique mirror with the old wild rose hips decorating the wall above. 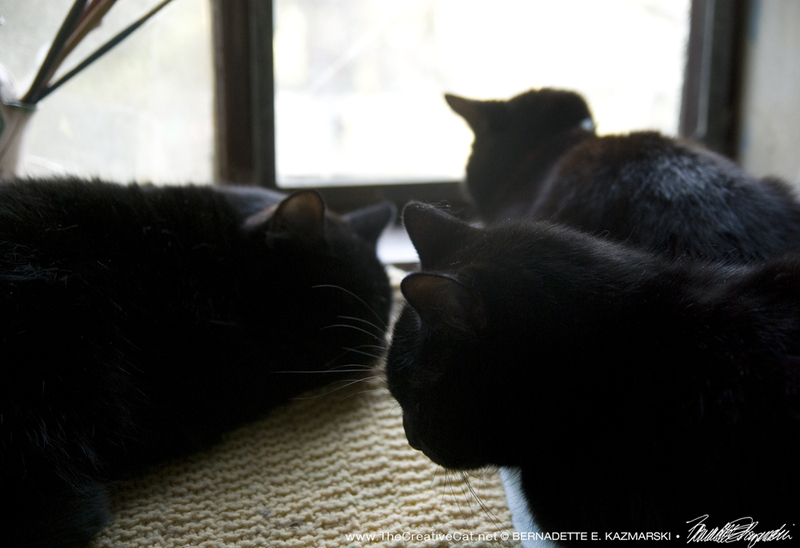 Typically, they will move before I get back with the camera, especially Hamlet who is suspicious of excess attention. But he was still there. 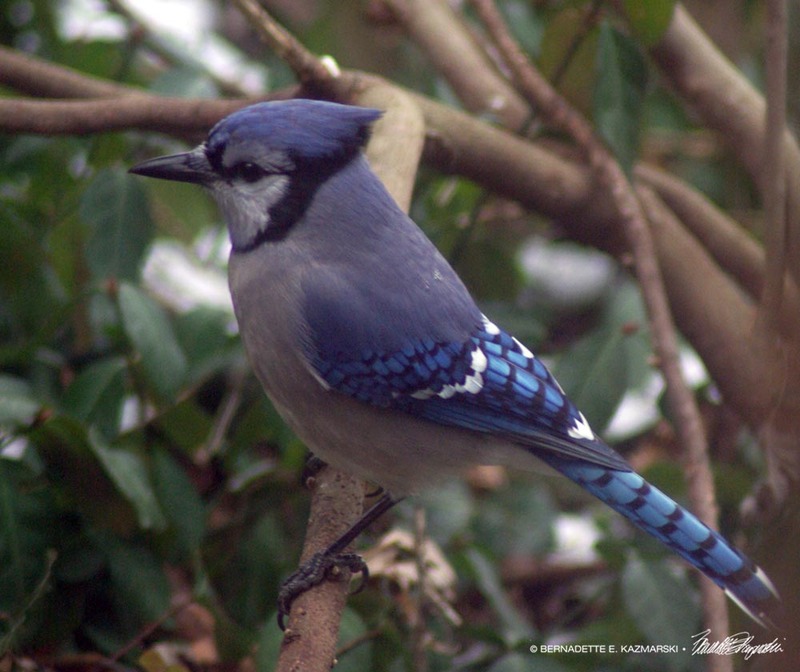 We all watched a blue jay. Their wings look like stained glass, to me at least. Mewsette, Sunshine and Mimi gather on my drafting table to contemplate the things cats contemplate while I contemplate what humans contemplate while in their studios. It was a very contemplative moment for all of us. I do spend a lot of time in contemplation, letting an idea run its course in my mind before I decide whether or not to do something with it, staring off into the distance out the window, one of the reasons my table always faces the window in the studio. Staring at a quietly contemplative cat or two works as well. Always obliging, I have always felt my feline family has enjoyed sharing those moments with me. It’s dinnertime. Or else. Or else they kill me with cute. Mr. Sunshine and Jelly Bean settle just outside the range of my desk light in the studio so they are largely in shadow and appear somewhat foreboding. Look how brown Jelly Bean is, and his brother so black. What marvels they are. Daily Photo: Pow! Right in the Kisser! She got him! I love how kittens start little wrestling matches, and Bella and Smokie are no exception. As far as I can see they evenly share the duties of instigator, walking up to the other no matter what they are doing when they are in the mood to have it out and get the other in a headlock or just take a leap. Before you know it a big ball of black fur is rolling around, and sometimes. Jelly Bean settles next to Emeraude, purring. I’m sure his purr is shaking the bed. It shakes my bed. He gave Emmie a little bath and settled down next to her in that way Bean has, solid, stable, comforting. Emmie didn’t seem to mind at all. His ulterior motive was probably her bowl of food, which he did not get, but I can tell it makes him feel good to be nice. Emeraude has been feeling well, and not so well. When she feels good it’s as if nothing is wrong, though she is also receiving a small dose of prednisone which is part of the reason for feeling fine and having a good appetite. But she has many times in between when she kind of hunches on her bed; this is why Bean is next to her, to try to comfort her a bit. But she’s feeling “okay”. Below, one of her favorite things is to steal bites of her food as I’m preparing it. I mix her medications with it and add water, but before I do she often gets up like this and gets her face in the bowl—it always makes me laugh, and I always let her do it. It’s not as if she’s been out of food at all or for very long, but the smell of a fresh can of food is just too much for her, she can’t control her impulses. I think Emeraude and food have been good friends all her life, and eating might be the last thing to go. Emeraude caught stealing her food. Another late night and Emeraude came cruising into the studio where the other black cats were all rolled up in balls asleep, looked at Mimi behind the door, came to me working at my easel, smelled everything and stood there inside one of Mewsette’s creations. Simple things are sometimes best. Oh, my, those poor kitties, what’s all over them? Don’t look Mewsette, it’s scary! My children, there are unfortunate kitties out there who are not as perfectly colored as you, but there is nothing wrong with them. They are perfectly normal even though they aren’t…perfect. This is what happens when cat parents don’t choose the right—oh, don’t worry about that! The right what, Mama Mimi?! You’re perfect, that’s what! You are absolutely perfect! Choose the right cat daddies is what Mimi is trying not to say. Sometimes cat moms, like human moms, have to evade the truth a bit where their children are concerned. Sunshine isn’t done playing yet. Mr. Sunshine wore out his brothers with bottlecap hockey and studio wrestling. Now Bean is sleeping on one side tucked up to his brother, and Giuseppe is sleeping on the other with his head tucked into Sunshine’s hip. They are done, but Sunshine still has energy. Not a problem. We got a few more bottlecaps and a ping pong ball and some rolled up balls of paper and had a party while his brothers blinked at us and went back to sleep. Jelly Bean and Mr. Sunshine up to no good. I have the feeling I caught Jelly Bean and Mr. Sunshine in the middle of a strategy session. I can never tell by Jelly Bean, who always pours on the charm and therefore always looks guilty, but Mr. Sunshine looks quite alert there in the background so I’m not sure what to think. It just looks as if they were in the middle of some sort of cat event planning. Jelly Bean acts cute and silly, but he is fully aware of his cuteness. None of his siblings has knowingly struck a pose in front of a mirror! I have a bi-fold door on the bathroom with a mirror so that I can look at my own self (why would I do that with all these cats to look at?) and so the bathroom seems a little bigger. The angle of this shot was difficult but I think I got the good part! That’s one shot of many, and I’ve included a slideshow of the entire photo shoot below. And he’s not new to admiring himself in mirrors! Here’s one photo of him that’s good for a laugh, a really lucky shot of him admiring himself in the hand mirror in the bathroom while it was being remodeled. I actually offer this one as a photo print and greeting card alone and in a collection called “Compositions in Black and Green”.